Welcome! I'm pleased to announce that our blog and website have moved to a new hosting platform that is responsive and mobile ready. It's been a big effort with all "hands on deck" here at Avente Tile. While we haven't been blogging during the update, we look forward to sharing again at the new location and name, Avente Tile Blog. I started the blogging at AventeTileTalk.com in 2008. Even though it's been a huge success; in recent years, it became disconnected at its own location - separate from our main site. So, after some work and changes, we are relaunching the blog here! Even though the blog has a slight different name and is hosted on a new platform along with our site, so that it's now "under the same roof" as our product catalog and shopping site, its primary mission remains unchanged. The Avente Tile blog is dedicated to the use, design and understanding of hand-painted ceramic tile and encaustic cement tile. The blog's purpose has been to provide a deeper understanding and appreciation about hand-painted ceramic tiles and cement tiles. These hand-crafted products have some unique issues regarding their look, use and installation. I know that open, frank discussion about these products and the sharing of ideas about these tiles will result in more-informed consumers, smarter buying decisions, and satisfied customers. I believe honest communication is the core of any great relationship. Tile Talk explores unique issues, such as installing hand-crafted cement tile. Having the blog in the same location as our product catalog and shopping site makes navigation and use easier. Our goal is to provide not only beautiful hand-crafted tile; but, excellent customer service with easy-to-use tools that will assist and guide the design process. Of course, we'll continue to share historical tile tours, customer installations, design tips, tile trends, and new products. One of the great benefits of tile is the fact that you can customize and make it your own design. 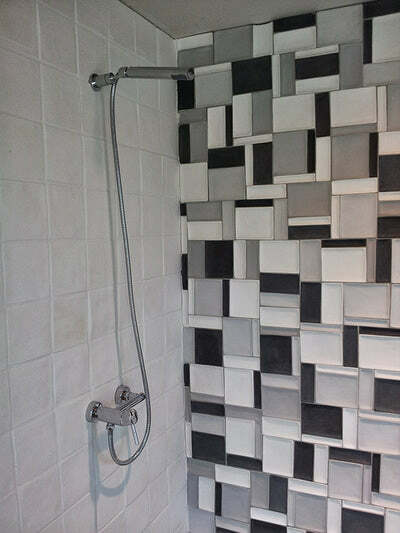 Given the exact same tiles, each customer can create a unique design that speaks to them. 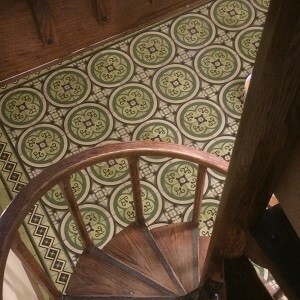 The blog will continue to explore pattern, design and tile layout considerations for any project. Having the blog in the same location allows us to seamlessly connect these detailed explanations with products, installation details, and design ideas. One other change is that our Cement Tile Design Ideas and Ceramic Tile Design Ideas are their own stand-alone blogs where we can share design inspiration for each tile. Avente's Tile Talk provides insight on the many designs and uses of cement tile, such as this tile rug. It's also a great time to thank those dedicated readers and followers of our blog that have contributed to our success. We hope that you will continue to support us in our new location and sign-up for monthly newsletter or RSS feed of these posts. Initially, our goal will be to post twice a week here. Look for posts on new topics each Tuesday a few times a month, during the #TileTuesday celebration on Twitter. We'll be sharing some of our most popular posts, like tiling stair risers, creating a tile rug, and how to use tile to finish an edge. We'll re-purpose these popular posts with fresh new design tips, the latest images, and a fresh approach that will provide greater insight. Of course, if you happen to miss, don't worry! Each post will be available through our archive and search tool. We welcome suggestions for other topics you'd like us to publish and discuss. 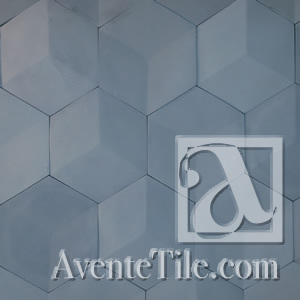 Please send requests to info@aventetile.com with your contact information. New products and tile trends, like these cement wall tiles in relief, are trends we'll share here. Did you enjoy today's post? You can learn more about encaustic cement tiles at our Cement Tile Info Center and our Spanish Tile Design Center. Our new website also provides great collections, grouped by styles, like our Pool Tile, field tile, and in stock cement tile. We also explore historically significant tile installations, such as the Adamson House in Malibu, CA, exciting photos of tile installations and designs, and perspectives from designers and architects who have specified and installed our hand-painted ceramic and cement tiles. 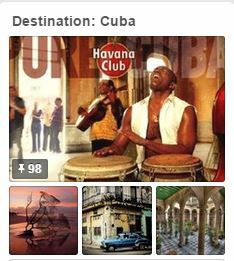 We think you'll find lots of inspiration! Labels: Avente Tile blog, Avente Tile. Hispaniola cement tiles Colorful, dimensional Hispaniola cement tiles liven up a powder room. The Hispaniola Collection from Avente Tile is an exclusive, made-to-order series of beautiful handmade cement tiles inspired by the climate, textures and surroundings of the Dominican Republic. First created by renowned sculptor Patricia Feinman, the Hispaniola collection allows you to create a cement tile that reflects your signature taste and style. The slight irregularities and subtle color changes inherit to handmade cement tiles only contribute to the tile's beauty. 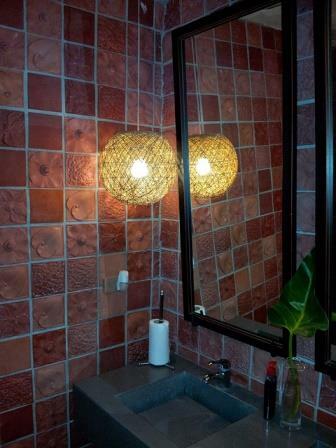 Hispaniola relief cement tiles not only add depth to this powder room, they also add much-needed light and openness. Along with their noticeable character and nuanced warmth, the Hispaniola Collection features more than 200 designs and 50 color options ranging from classic to modern. Because of their variety and customization capabilities, these tiles can be brought into almost any style of décor or setting. 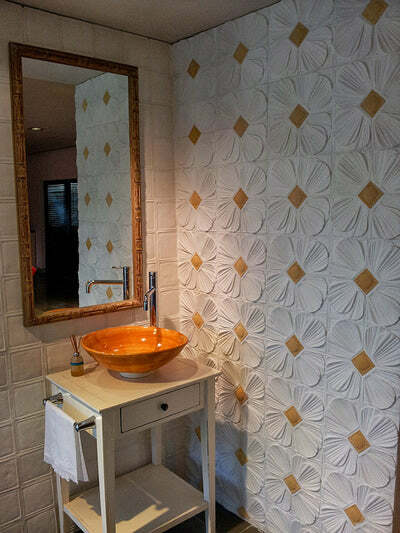 In this powder room, Hispaniola relief tiles add texture, while complementing their surroundings. The tiles in the Hispaniola Collection are made of white Portland cement, marble dust, and mineral pigments. To make each tile unique, the cement, marble and pigment mixture is poured into molds and then vibrated to remove air pockets ensuring a solid product. Also, because the colors are embedded within the tile rather than painted on, the colors will neither fade nor deteriorate over time. For design ideas, take a look at a beautiful bathroom tiled with Hispaniola tiles, as well as a gorgeous Hispaniola kitchen backsplash. To further complement our collection of handmade relief cement tiles, we recently introduced Elevations. Available in six shapes (Drop, Concave Rectangles, Petals, 3D Hexagon, Concave Hexagons, and Angles), this unique series is perfect for the design industry not only because it eloquently combines geometric shapes in both convex and concave relief, but it also offers an extensive color palette featuring more than 60 colors. Elevations edgy, contemporary look of high relief geometric designs stand out for their architectural value. Elevations is well-suited suited for wall applications and can be installed with or without grout. Additionally, the tiles are available with a standard smooth surface or an optional waxed finish that provides a satin sheen. 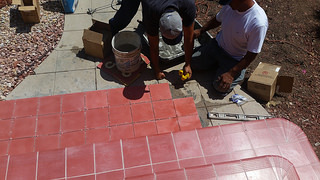 The tile come pre-sealed with a penetrating sealer and are ready to install. If you are interested in incorporating Hispaniola or Elevations tiles in your design, then please contact Avente Tile for assistance.